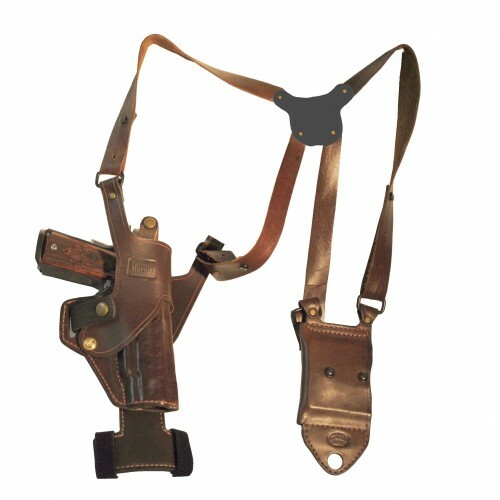 The Stormer made by Stoner Holsters is a vertical custom shoulder holster designed to allow the user draw the most natural way possible. The Stormer comes with a shoulder harness, double horizontal magazine pouch, magazine side tie down, holster shell, and removable holster insert. The removable holster insert pivots inside of the shell allowing the user to draw from any position. The removable holster insert has a stainless steel reinforcement and lining option available. The holster insert also includes a pull through break, eliminating the need to use your thumb to release your holster. The Stormer attaches at your belt with a stainless steel reinforced leather connector and is then tied down to your belt. This keeps the holster from moving and makes it feel solid. Effortless Pull-through snap to secure your gun in the holster. Holster insert and mag pouch can be easily replaced, allowing you to switch out for a different gun without readjusting your harness.